From 1886 through 1894 the U.S. Army's Department of the Platte leased this site to provide marksmanship training for Fort Omaha soldiers. Each year in late summer, the range also hosted troops from other Great Plains posts for the department rifle, carbine, and revolver competition. Periodically, the Division of the Missouri matches and the army's "distinguished marksmen" matches, the latter featuring top shooters from around the nation, were held here. Maj. Guy V. Henry, Sr., a noted cavalry officer, was in charge of the range through 1889. The target "pits" lay to the north/northwest (an area now occupied by houses) with designated firing points from 200 to 600 yards south/southeast of the pits. When the range was in use, tent camps for officers and enlisted men stood to the east overlooking the Missouri River. Soldiers and civilian spectators reached the range via a railroad below the bluff. As nearby Fort Crook neared completion, the army in 1895 discontinued the Bellevue range. Unfortunately, new target ranges at the fort proved unsatisfactory. Ineffective backstops sometimes allowed bullets to fall on private property outside the military reservation. 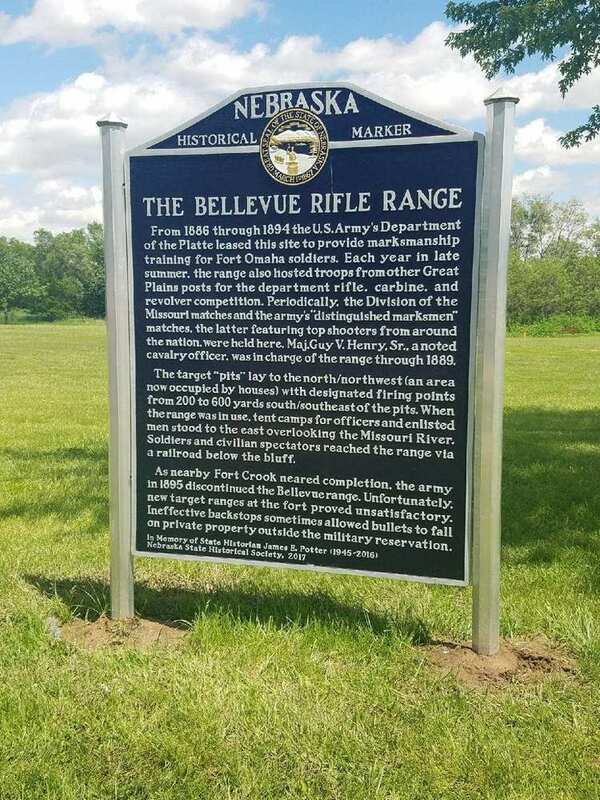 “Bellevue Rifle Range,” Explore Nebraska History, accessed April 18, 2019, https://mynehistory.com/items/show/453.